Many chameleons have the remarkable ability to exhibit complex and rapid color changes during social interactions. A collaboration between the teams led by professors Michel Milinkovitch and Dirk van der Marel, unveils the mechanisms that regulate this phenomenon. A study published in Nature Communications demonstrates that the changes take place via the active tuning of a lattice of nanocrystals present in a superficial layer of dermal cells called iridophores. The researchers also reveal the existence of a deeper population of iridophores with larger and less ordered crystals that reflect the infrared light. The organisation of iridophores into two superimposed layers constitutes an evolutionary novelty and it allows the chameleons to rapidly shift between efficient camouflage and spectacular display, while providing passive thermal protection. Male chameleons are popular for their ability to change colorful adornments depending on their behaviour. If the mechanisms responsible for a transformation towards a darker skin are known, those that regulate the transition from a lively color to another vivid hue remained mysterious. Some species, such as the panther chameleon, are able to carry out such a change within one or two minutes to court a female or face a competing male. Besides brown, red and yellow pigments, chameleons and other reptiles display so-called structural colors. «These colors are generated without pigments, via a physical phenomenon of optical interference. They result from interactions between certain wavelengths and nanoscopic structures, such as tiny crystals present in the skin of the reptiles», says Michel Milinkovitch. These nanocrystals are arranged in layers that alternate with cytoplasm, within cells called iridophores. The structure thus formed allows a selective reflection of certain wavelengths, which contributes to the vivid colors of numerous reptiles. 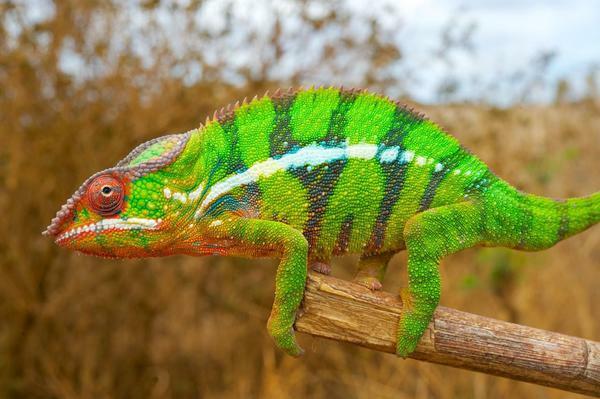 To determine how the transition from one flashy color to another one is carried out in the panther chameleon, the researchers of two laboratories at UNIGE worked hand in hand, combining their expertise in both quantum physics and in evolutionary biology. «We discovered that the animal changes its colors via the active tuning of a lattice of nanocrystals. When the chameleon is calm, the latter are organised into a dense network and reflect the blue wavelengths. In contrast, when excited, it loosens its lattice of nanocrystals, which allows the reflection of other colors, such as yellows or reds», explain the physicist Jérémie Teyssier and the biologist Suzanne Saenko, co-first authors of the article. This constitutes a unique example of an autoorganised intracellular optical system controlled by the chameleon. The scientists also demonstrated the existence of a second deeper layer of iridophores. «These cells, which contain larger and less ordered crystals, reflect a substantial proportion of the infrared wavelengths», states Michel Milinkovitch. This forms an excellent protection against the thermal effects of high exposure to sun radiations in low-latitude regions. The organisation of iridophores in two superimposed layers constitutes an evolutionary novelty: it allows the chameleons to rapidly shift between efficient camouflage and spectacular display, while providing passive thermal protection. In their future research, the scientists will explore the mechanisms that explain the development of an ordered nanocrystals lattice within iridophores, as well as the molecular and cellular mechanisms that allow chameleons to control the geometry of this lattice.